When I took my career break in the summer of 2013 we looked at ways to reduce our expenditure. An obvious way was to start shopping in a discount supermarket. While I love my choice of supermarket for the uninitiated the check out experience can be mildly hair-raising. You need your wits about you as products seem to fly off the end of the check-out conveyor belt. You need to be on your game if you want to pack your bags at that point and not end up with a massive pile of goods hanging precariously off the edge of the check out. I’m usually not on my game so just fling them into the trolley and then have to pack them afterwards in the packing area which is a total pain. So when I was contacted about trying out Trolley bags I was super excited. What a simple but super clever idea. Shopping bags that are durable, reusable and easy to place into your trolley to keep your hands free to do the packing, even at speed in a discount supermarket! I couldn’t wait to give them a go. 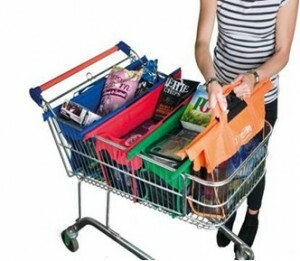 They roll neatly up and have handles to carry them into the supermarket and hang them off your trolley while you go about your regular shopping. 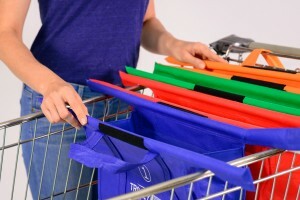 Once you empty out your products onto the conveyor belt you can unclip the velcro strap and spread the 4 different coloured and different sized bags across length of the trolley. The edges of the bags are designed to sit on the edge of the trolley, keeping the bag open and in place. It makes the whole process so easy. It just comes down to remembering that bag number 1, the biggest one, should be used for the bulky but light items and the smallest bag for the heaviest items. I’m sure once I’ve given them a go a few times I will get even quicker but I can tell you then sense of satisfaction to be able to walk out of the supermarket and not have to stop for ten minutes to take everything out of my trolley again to pack was blissful (it is the simple things, isn’t it?!). If your local supermarket has a scan and shop facility then there is no fumbling around trying to get your product into the bags. Just scan and pop them into the appropriate bag. Once at the car the bags unclip from each other and go into the boot as any other shopping bags. At home, again, like any other bag, they are just carried in, unpacked and then clipped back together and rolled up for next shopping outing. Check out this video that explains them perfectly! Trolley Bags – The revolutionary trolley bags system that takes the hassle out of shopping from Laura on Vimeo. In Ireland, and I am sure in many other countries, plastic shopping bags are now chargeable. You can buy slightly more durable bags that give a bit more time but eventually they rip. Investing in Trolley bags at only €23.99 + p&p / £17.99 + pp in UK certainly seems like a no brainer to me. I haven’t even mentioned the environmental impact of not using plastic bags and the time savings at the till. These bags are just a win all round. 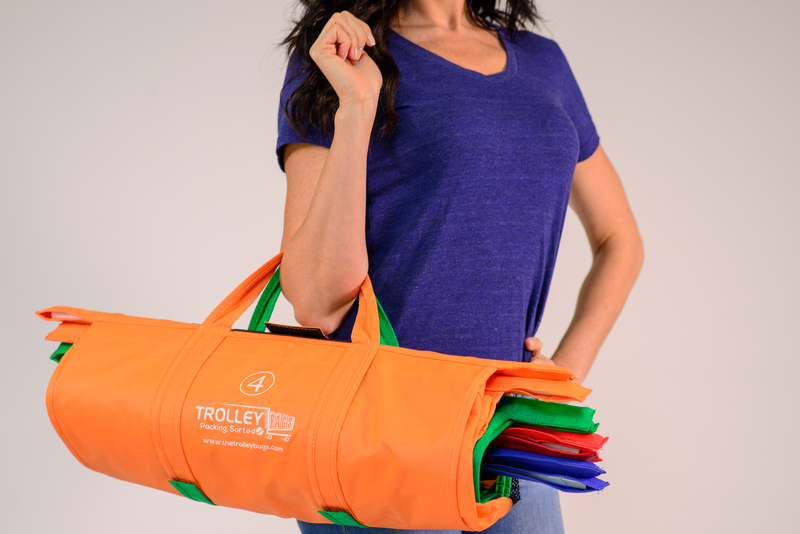 Trolley bags come in two sizes; regular for a regular trolley and express for the trolley that is less deep. The only real difference being the depth of the bag. I got to try the express size and would certainly be in the market for the regular sized ones. Would I recommend them? Hell yes! I love my set. Like what you see? I am delighted to have another set to giveaway to one lucky reader. There are loads of ways to enter via the Rafflecopter form below. Of course if you are not the lucky winner Trolley Bags are available to buy online on the Trolley bags website. Disclosure: This is not a sponsored post. I was provided with a set of Trolley Bags for the purposes of review and one to giveaway. All opinions are my own. Next articleAnd the winner of the Trolley Bags is…….. Complete pain….especially with kids! They are really convenient. They are a great idea aren’t they! So simple, but innovative. Good luck in draw. Have entered (I think) look great! These are ingenious – I live in fear of the checkout in Aldi, it’s as if they’re working towards some speed challenge and expecting the customer to have practiced for this at home! These bags look like they’d definitely reduce the blood pressure by a tiny bit at least! Fingers crossed for a win! lol, yes definitely some undisclosed speed challenge happening! Good luck! Yes, the are a good investment rather than paying for plastic. Good luck! These look so practical and pretty. They are indeed. Good luck! How clever, I’d love them! They are so clever! Good luck in draw! They do fold up so nicely. So much better than a big pile of half ripped bags that usually occupy my boot! OMG I so need to investigate these more, this should make everyones life so much easier. no more bags folding over while you try to pack!! Oh the bags folding over. It’s how I never managed to pack while products flew off the end of the check out. These just stand up, wide open leaving your two hands free to pack. Ingenius! What a great idea,but won’t they be heavy when full? The idea is you put the heavy stuff in the smallest bag so I guess it can’t get that heavy. I certainly had no issues with the weight of them. Maybe because I had express size. Haven’t tried the regular trolley size so can’t comment. A brilliant idea,anything to help make the supermarket shop a little easier has to be good news. These look great, especially if you’re doing a big shop! They are great. Absolutely for a bigger shop. Not really necessary when running in for a pint of milk and some bread! Though you could unclip one bag and bring it with you! These look so handy, and I imagine they get a lot of comments in the shops! Brilliant giveaway. These would be a dream to have, especially when you buy lots of items! I do so envy people who pack their shopping away tidily. I end up chucking mine in willy nilly getting squashed bread etc. These look really useful and I could do them proud. Oh yes, I’m right there with you but these bags have helped me enormously. These look amazing, would certainly make shopping with 3 young children much easier. What a fantastic idea. I would love to win this fab giveaway, would make food shopping so much easier. Thanks Gemma, glad you enjoyed it. Good luck in giveaway. Would love to try them with scan and shop. I’d say they would be brilliant. They sure do! Good luck. I would love to try these , they would be so handy . where can I buy a hang and shop bag. If you follow the link in the post you can buy them online. They are only available in certain countries.